All through the primaries the worst GOP nightmare was of Donald Trump standing as an independent 3rd party candidate. That fear was one of the factors which led to his winning the nomination against massive “establishment” opposition. They feared an official Republican candidate being humiliated by a rampant, populist, independent Trump. And they were afraid that a presidential annihilation would have a knock-on effect on Republican chances in the House. But they are feeling queasy about being identified with Trump’s crude populism. Now, as the Republican establishment distance themselves from Trump they have effectively brought their own nightmare scenario into play. 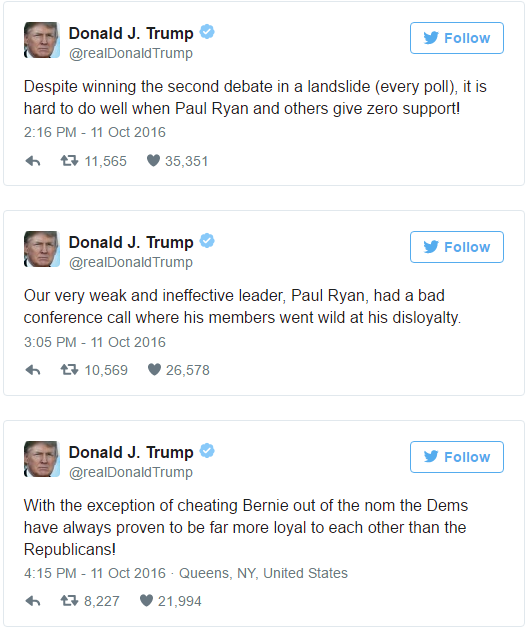 Paul Ryan is going down a lose-lose road. Trump no longer has to be restrained from castigating the Bush legacy and the ineffective republican leaders in the House and in the Senate. Really Trump should no longer have a chance in November. But something strange is abroad and he refuses to be buried. But whatever the result may be in November, the GOP will have to face its nightmare scenario. This entry was posted on October 11, 2016 at 7:34 pm and is filed under Behaviour, Politics, US. You can follow any responses to this entry through the RSS 2.0 feed. Both comments and pings are currently closed.